Only recently Michael Ballé said: “Let’s not confuse lean and TPS… they are related, but not the same.” Finally. Without question, LEI’s influence has been great. 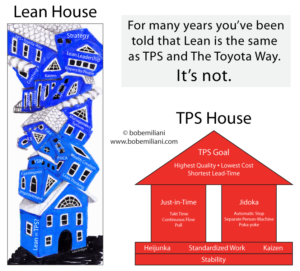 So great, that many organizations cannot be convinced that value stream maps are not necessary in order to see waste and improve processes; that A3 reports are for use by managers, not front-line workers; that “trystorming” at the genba is more important than brainstorming in conference rooms; or, that Toyota-style industrial engineering-based kaizen is fundamental to creating flow. People have become dependent on LEI to feed them knowledge and define their course of action, rather than thinking for one’s self. Thus far, nobody has offered any evidence that B = A in terms of business results. In my view, James P. Womack and Daniel T. Jones’ interpretation of TPS has been, plainly stated, wacky. Built piece-by-piece over the years, after they finally recognize the need for each additional piece, like an old manufacturing building with multiple add-ons to the primary structure. 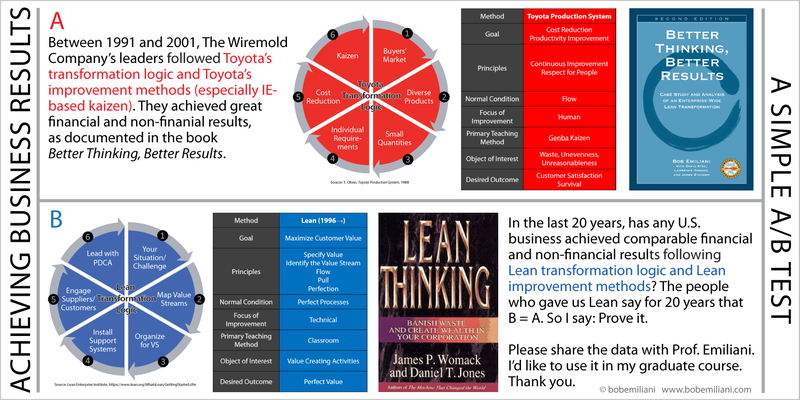 The result is a disjointed representation of Toyota production system and The Toyota Way that hardly makes any sense. In following LEIs prescriptions, both individuals and organizations have put a lot of effort into improvement over the years and have achieved mostly meager business results. In the middle image, above, I posed a simple A/B test in social media, that, thus far, has gone unchallenged. The empirical evidence indicates that the results achieved in most organizations over the last 20 years (B) do not impress senior leaders, which forces them to look for other (typically zero-sum) ways to improve financial and non-financial performance. That is a terrible outcome. Organizations that have focused on TPS (A) have achieved much better results, and their leaders rarely use zero-sum methods to improve performance. That means better outcomes for all stakeholders – employees, suppliers, customers, investors, and communities. 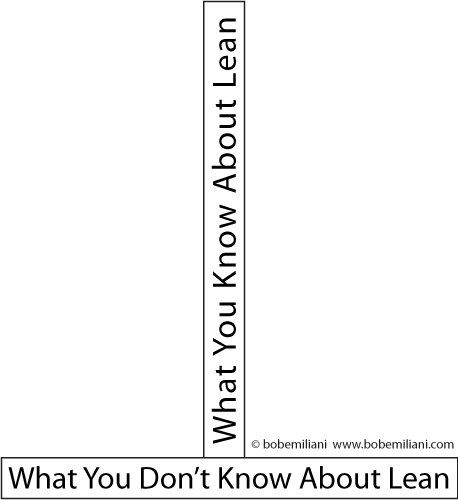 Despite this, there exists an illusion (image at right) that people know more about Lean than they actually do. This, apparently, is based on what they have been told or read, not based on what they have done with by getting their hands dirty. As Michael Ballé recently noted on LinkedIn, at a Lean conference attended by 250 people, only 3 or 4 had read Womack and Jones’ books. Have they read Ohno’s books on TPS? Probably not. 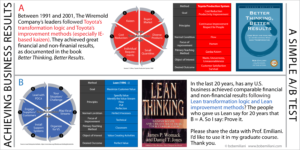 Or Liker’s books on Toyota? Probably not. Have they read about Taylor’s Scientific Management? Most assuredly not. 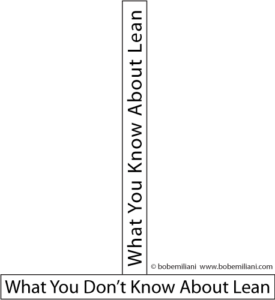 Lean is hardly the first subject that people have taken an interest in without bothering to study it. And, finally, there is the harm that has come to people, through layoffs, bureaucratized Lean, flat wages despite productivity improvement, and so on, for which there is little acknowledgment and no apparent empathy, sadness, or regret. History has shown that harm done to people is common to progressive management in general, not to Lean in particular, among managers schooled in so-called “Western” business practices. For Lean, the helpful guiding hand of history was ignored. So, for these reasons, I think it is time for change and improvement. That challenge rests in your hands. As a 16 year Toyota alum, I find this article spot on. I’ve wondered for years about the fascination with the VSM. From my background it makes no sense. It bypasses the problem solving process by implicitly suggesting that the problem lies in the details, ignoring the systemic issues such as a push system. Glad someone is speaking out.